Complete your continuing education to renew your Georgia contractor license today. All of our courses can be completed At Your Pace Online to help you meet the state's requirements to maintain your license. Once you finish your course, you will receive an official certificate of completion to save for your records. Residential Basic license holders must obtain 3 hours of approved CE per year. Residential Light Commercial license holders must obtain 6 hours of approved CE per year. Online and correspondence courses may not exceed 50% of the continuing education hours required. Though CE is due every year, all contractors must renew their license biennially by June 30 of even numbered years. 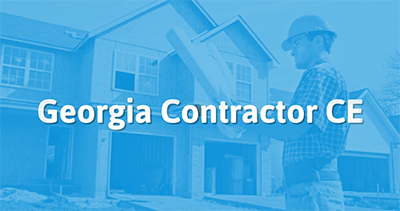 This 3 hour course is built to meet the annual CE requirements for Residential contractors licensed in Georgia. This 6 hour course is built to meet the annual CE requirements for light commercial contractors licensed in Georgia. This course will satisfy 1.5 hours of continuing education requirements and examines the overall importance of kitchen and bath builds, remodels and their relation to resale values.